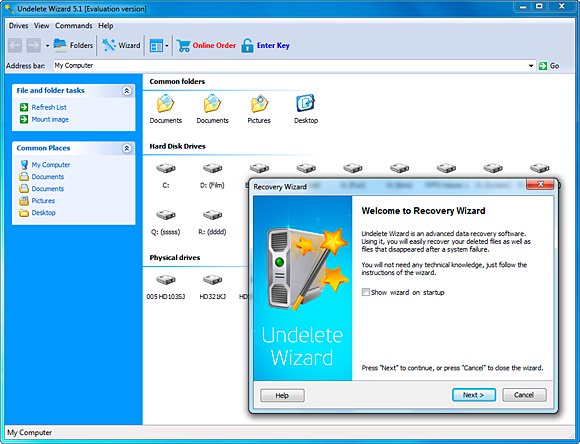 Download Undelete Wizard and welcome back your deleted files! Recover all types of files easily and automatically. In addition to the many supported formats, Undelete Wizard can reliably recover all types of digital images. The tool is not limited to recovering digital pictures in common formats such as JPG, GIF, BMP, PNG or TIFF. In addition to those, it also supports many popular RAW formats produced by advanced point-and-shoot and all digital SLR cameras. RAW, DNG, CR2, NEF and many more digital picture and RAW file formats can be recovered from digital memory cards and cameras. FAT12, FAT16, FAT32, NTFS (NT 4), NTFS5 (2000, XP).